Image by Menchie's in Mt. P.
King Street is the only place in the Charleston are a getting covered in the frozen yogurt craze: A local branch of U.S. and Canada chain Menchie's has opened in Mount Pleasant's Belle Hall shopping center. The Charleston City Paper spotted this one and has a bit of info on the new spot; take a read here. The store is on Facebook and I found this buy-one-get-one-free coupon. They're at 644 Long Point Road. (843) 654-9040. 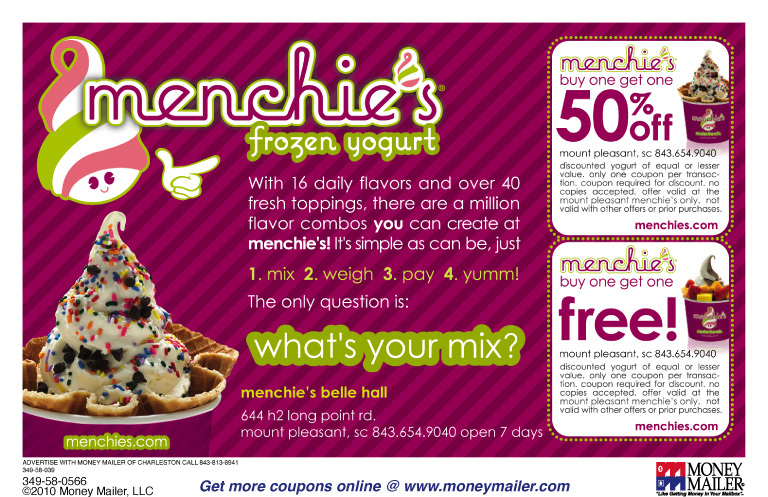 Mon - Thurs: 11 a.m. - 10 p.m.; Fri-Sat: 11 a.m. - 11 p.m.; Sun: 12 -10 p.m.
Now this is the time for all food lovers to visit Menchie's as they are providing the best food over there as per writing for companies articles. I have been planning to visit there as i am a foodie too.